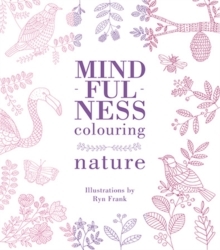 This creative colouring book is the perfect companion to the bestselling The Little Book of Mindfulness and a follow-up to the highly successful Mindfulness Colouring. The captivating line illustrations of flora and fauna, which are specially designed for creative colouring in, encapsulate the beauty of the natural world. Accompanying the illustration are a collection of inspirational quotes that will enable you to still the mind and relax the body, whilst generating and boosting a feeling of well-being and contentment that will permeate every aspect of everyday life. The perfect gift to bring lasting happiness and peace for friends and family. This is a practical way to relax the mind, whilst subconsciously developing selfknowledge, expanding the imagination and nurturing creativity. Continuing the two bestselling subjects in books right now, the original The Little Book of Mindfulness has sold 300,000 copies worldwide, while the Mindfulness Coloring Books series has already sold 110,000 copies worldwide.